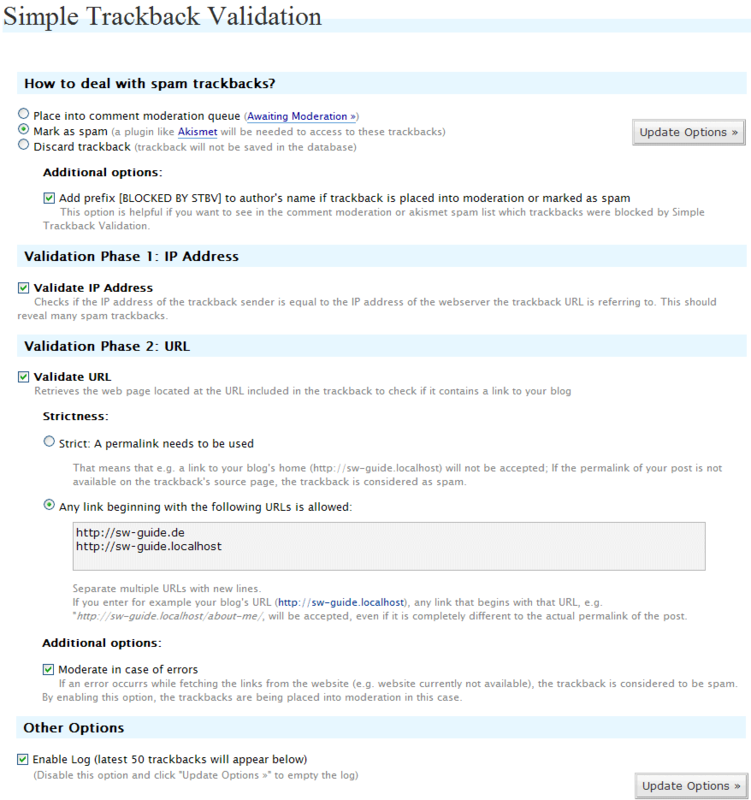 Simple Trackback Validation Plugin for WordPress 2.x performs simple but very effective tests on all incoming trackbacks in order to stop trackback spam. checks if the IP address of the trackback sender is equal to the IP address of the webserver the trackback URL is referring to. This reveals almost every spam trackback (more than 99%) since spammers do usually use bots which are not running on the machine of their customers. Download the plugin (see „Downloads“ above). Decompress the .zip archive and put the files into your plugins directory (/wp-content/plugins/) or into a sub directory of the plugins directory. Go to «WordPress Administration > Options > Simple TB Validation», adjust the options and save. They use an outdated version of the php class Snoopy. For example on 24th October 2005 a bug fix and security release of Snoopy was released and Rice University released a bugfix on 21st May 2006, but they have not updated the Snoopy class in their download package. So Rice University is definitively not inspiring confidence. Also it seems that they do not even have noticed that WordPress does already include the Snoopy class, available at wp-includes/class-snoopy.php. I am using the WordPress snoopy class in my plugin. Trackbacks that appear to be spam are flagged as spam, however when using the standard WordPress installation there is no way to moderate these trackbacks, an additional plugin is necessary for moderation, e.g. Akismet. When using my Simple Trackback Validation Plugin, trackbacks that haven’t passed the validation are placed into the comment moderation queue and can be approved or deleted easily. By default, the option „Submit data to the Computer Security Lab at Rice University for research“ is activated, but they inform the user neither in the options nor on their website that this causes that every trackback is being stored in a separate MySQL table which blows up the database and has negative effects regarding performance. Also, they don’t validate the IP addresses which reveals more than 99% of all spam trackbacks. Math Comment Spam Protection: Asks the visitor making the comment to answer a simple math question. This is intended to prove that the visitor is a human being and not a spam robot. This stops many, many spam attacks by spam bots and has positive effects regarding your blog performance since no read or write access to MySQL is necessary like it is when using some other anti-spam plugins. New feature: It is checked if the IP address of the trackback sender is equal to the IP address of the webserver the trackback URL is referring to. New feature: Improvement of handling Snoopy errors incl. new option for this. New feature: Improved plugin options. New feature: Improved performance: plugin is now applied prior to any other processing, when saving a new comment in the database. Bug fix: E-mails are no longer being sent if a trackback is considered to be spam. New feature: A third option regarding how to deal with trackback spam is available: you can let trackback spams delete immediately. Bug fix: Now a WP function is being used for changing trackback status, this solve a comment count issue. New feature: Now you can select in the options how to deal with spam trackbacks: place into comment moderation queue or mark as spam.